We are currently working with our website designer to create our new shop. In the meantime we are happy to sell these items and post them to anywhere within mainland UK, please allow 7-10 days for delivery. Please find below a selection of crystals that we have available to purchase, all of these crystals and crystal bowls are ethically sourced and created with love. 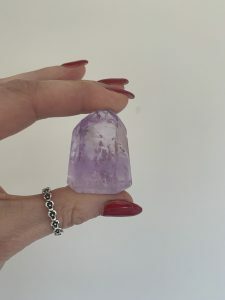 All of our crystals are energetically attuned to you by Ascending Angels before delivery, if you are purchasing a crystal as a gift for someone else please do let us know so we can empower the crystal for them. We are delighted to be able to sell these wonderful healing singing crystal bowls to you. These crystal bowls are all created at the 432HZ sacred ancient frequency resonance. 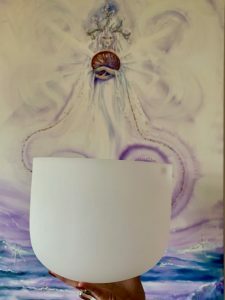 They feel so very angelic and as they come from us at Ascending Angels we energise each bowl with the love and blessings of the Ascending Angels. Our singing bowls are available to order by emailing marisa@ascendingangels.com, we do have limited stock so please contact us for prices and availability. 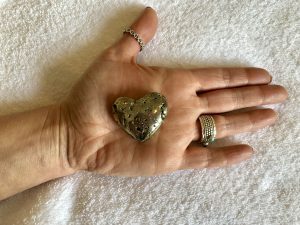 This beautiful grounding pyrite heart is a stone of hidden fire. It resonates with Fire energy, symbolising the warmth and lasting presence of the sun and the ability to generate wealth by one’s own power. It is masculine in nature, a stone of action, vitality and will. It taps into one’s abilities and potential, stimulating the flow of ideas. It brings confidence and the persistence to carry things through to completion. Grounding, manifestational, protects against negative energies, environmental pollutants, emotional attack and physical harm. Amethyst a stone of spirituality and contentment. It is known for its metaphysical abilities to calm the mind and inspire an enhanced meditative state. Its high frequency purifies the aura and creates a protective shield of Light around the body, allowing one to remain clear and centered while opening to spiritual direction. This gentle Angelic Healing stone enhances ones metaphysical ability. Selenites healing properties are about activation and reaching higher planes. It is known for connecting to the third eye, crown, transpersonal and Etheric chakras. Through radiating light energy, it promotes purity and honesty. It forces the person holding it to be honest with themselves. By clearing energy blockages, selenite allows for liquid-like energy fluidity. It can align the chakras and raise awareness to a higher plane. 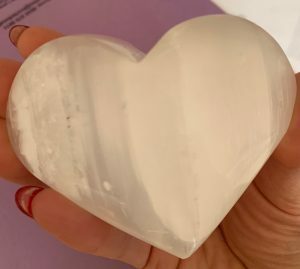 This is the ideal stone for connecting with spirit guides or guardian angels. Due to its programmability, it is one of the best facilitators for transmitting the advice and information that one is seeking from their guide. It connects people to their highest level of consciousness where they are most open and accepting of symbolic messaging. 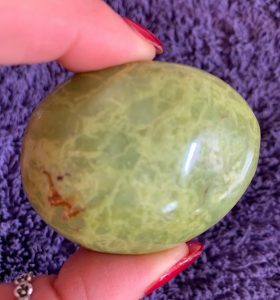 Kiwi Opal is the stone of nurturing as it help instil feelings of inner peace and serenity, while giving a sense direction on how to support your life and relationships. Kiwi Opal is ideal to use during meditation and visionary states. It can be helpful in healing viruses and infections as well as healing plants and animals. This crystal helps to strengthen and stabilise the bodies immune system and can also be helpful in easing menstrual discomfort and upset. This is a good stone for women to use throughout all their hormonal cycles as it helps to bring comfort and nurturing support. Merkabas are tetrahedrons, made by the intersection of two, three-sided pyramids. In ancient Egyptian, the literal translation of Merkaba is broken down by syllable to mean: Mer-rotaing fields of light, Ka-spirit, and Ba-soul. 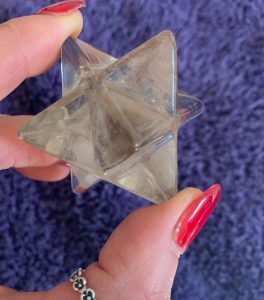 It is one of the Sacred Geometry forms, The Merkaba is believed to achieve transformation on all levels of existence. In Hebrew, Merkaba literally means “Chariot”. The Merkaba literally becomes a vehicle for ascension. Smokey Quartz is a very powerful metaphysical stone which emits a high level of energy. It is often used in manifestation for it’s ability to ground vibrational energy into the physical world. Smokey Quartz helps ground you with Earth energies, and is good for working with the root chakra. Smokey Quartz is also a great stone for pain relief, and helps to prevent healing crises after a strong energy session. You can use these Smokey Quartz Merkabas to help ground and integrate messages and/or spiritual energy received in higher chakras into the lower chakras, and to help anchor expanded consciousness into the physical body. The Sacred Geometry of Smokey Quartz combines with the Sacred Geometry of the Merkaba, creating a powerful energy piece. 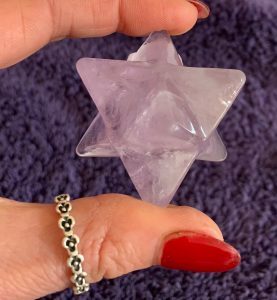 The Amethyst Merkaba can be used to amplify your intuition, promote a clearer connection to the higher self and to enhance your intuition and psychic abilities.